Andrew Lane (born 1963), who also writes as Andy Lane, is a British author and journalist. Macmillan Children’s Books in the UK are currently publishing two series of Young Adult novels by Andrew Lane, while Adaptive Books in the USA are publishing a third Young Adult series. He has also just signed with Hot Key Books to write a series of teenage espionage novels, the first two of which will be published in 2018. The first series of books focuses on the early life of the world’s most famous fictional character – Sherlock Holmes. The series was developed in conjunction with the estate of Sherlock Holmes’s creator – Sir Arthur Conan Doyle. 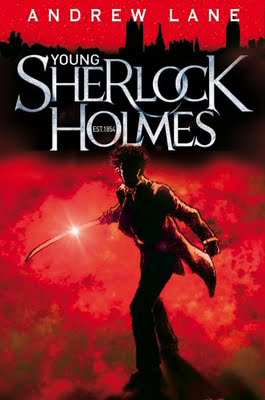 The first book in Macmillan’s Young Sherlock Holmes series — Death Cloud — was published in the UK in June 2010 (February 2011 in the USA). It has been followed by seven more titles – Red Leech (Rebel Fire in the USA), Black Ice, Fire Storm, Snake Bite, Knife Edge, Stone Cold and Night Break. So far the series has sold, in translation, to over 40 countries. More titles are expected. The second Macmillan series – Lost Worlds – follows disabled 15-year-old Calum Challenger, who is co-ordinating a search from his London apartment to find “cryptids” – creatures considered so rare that many do not believe they even exist. Calum’s intention is to use the creatures’ DNA to help protect the species, but also to search for a cure for his own paralysis. His team comprises a computer hacker named Tara, a free runner named Gecko, an ex-marine nick-named “Rhino” and a compulsive shopaholic named Natalie, but they are being watched by the mysterious Nemor Corporation, who want the cryptids for their own purposes. The third series, for Adaptive Books – Crusoe – Dawn of Spies – begins with a teenage Robinson Crusoe and a female friend named Friday arriving back in England in 1683 after having been stranded on a desert island for a few years. They immediately find themselves embroiled in adventures involving spies, alchemy and strange tattoos… adventures that could change the world! Andy has also written a number of spin-off novels and audio dramas based on the BBC science fiction television series Doctor Who (and a novel for the Doctor Who spin-off Torchwood), as well as assorted non-fiction books based upon popular film and TV franchises such as James Bond, Wallis and Gromit and Austin Powers. He has also written TV storylines and scripts for the Sky One science fiction series Space Island One. Andy had already shown an extensive knowledge of the Holmes character and continuity in his Doctor Who novel All-Consuming Fire in which he created The Library of St. John the Beheaded as a meeting place for the worlds of Sherlock Holmes and Doctor Who. Andrew Lane originally studied Physics at Warwick University, where he was a contemporary and friend of writers Justin Richards and Craig Hinton. He currently lives with his wife and son in Dorset, England. He is represented by Robert Kirby at United Agents.